Cllr James Cousins, the first Wandsworth Councillor to set up a blog, was up early this morning to support the clean-up, having added his twitter activity to others that helped to raise the Battersea Broom Army from amongst the local citizenry - ready armed with brooms, dustpans etc to clean up Clapham Junction - Heart of Battersea. James represents Shaftesbury Ward, which includes almost all of Lavender Hill, which was affected last night, including the site of the Party Shop, which was torched by the looters. Also present were two local Northcote Ward Councillors, Peter Dawson and Jenny Browne - Clapham Junction, St John's Road and the bottom of Lavender Hill are located in their 'patch'. 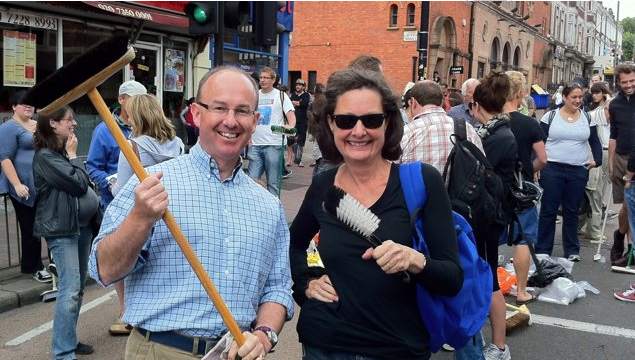 Here is Jenny (to right of picture) armed with her own brush ready to sweep up the streets with local resident and co-chair of the SW11tch Back to Battersea campaign Philip Beddows. If anyone knows of other Battersea Councillors who have blogs, we would be happy to add them to our links page along with James's.